Members of Parliament. Gladly we present to your commission, on your request, our book Green Growth. Gladly, because we feel that our subject concerns everybody. That subject is: ‘how is the Netherlands, how is Europe, going to earn its income in twenty-five years’ time, in a sustainable way’. In our book, we submit an optimistic answer. Quite remarkably so. Because most news items nowadays have a pessimistic undertone. We have the banking crisis, the Euro crisis, the climate crisis, and in the long run also the competition of low-wage countries. Not to speak of international tensions. But optimistic we are. One of the reasons for this optimism is that we have taken a close look at the future plans of Dutch industries. Adequate plans of industrial companies are cause for optimism about the future. And we have complete trust in the course that Dutch industries have set out on. Including agriculture and horticulture, that are important for Dutch exports. 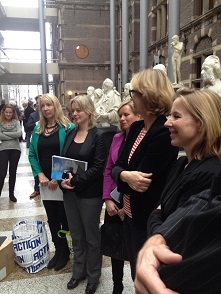 The word that embraces the entire vision of Dutch industries is sustainability. Meaning in this context: more and better results from less inputs. More and better tomatoes using less water and less insecticides. Higher-value plastics using less feedstock. Et cetera. In other words: green growth, the title of our book. Dutch industries have made quite some progress in that area already. And they envisage to pursue vigorously the same path in the future. Industries have laid it all down in their own documents. They testify to that vision in unique documents, drawn up when Dutch government formed the ‘top sectors’. In those documents, all major industrial branches have laid down their R&D vision. Of course we can read from the R&D programs how industries plan to keep abreast of the international competition in the future. Reading the top sector plans clearly shows: sustainability will become the backbone of our industry. We hope that your commission will take good notice of this. Industry has done so all on its own – government wavers in its policy and would be well-advised to orient itself better on the potential of the top sector plans. Technology is on a course towards sustainability. That shows most clearly in green chemistry. Chemical industry increasingly uses mild reactions, at low temperatures, using little energy, producing little waste, and posing little threat to those living nearby. Moreover, and that is going to be important, from biobased feedstock: agricultural products and side-streams. The biobased economy. Based on the high yields of European agriculture, even on excess production. For instance, North-western Europe produces a wonderful feedstock for that biobased economy: the sugar beet. A crop with a fantastic yield, and a very good feedstock for mild chemical processes. Dutch sugar industries and sustainable chemical companies like DSM look forward eagerly for 2017, when the EU will at last deregulate the sugar market. Earning an extra income to the farmer. The sugar beet as the basis for new and sustainable economic growth, we could not have imagined it ten years ago. So, if sustainability is the issue, let us not merely concentrate on energy. Sustainable energy is important. But is just half of the story. We also need a sustainable industry. And that is precisely the field in which industry would like to earn its money in the future. Industry itself would like to become more sustainable quickly. If government policies would make clear choices in favour of this pursuit, industry could attain that goal twice as quickly. We conclude with two requests on government for economic policy. Firstly, much more attention for the potential of sustainable industry. The Netherlands has a strong position in fields like water technology, agriculture and horticulture, nano technology, new materials, solar cell technology. An excellent basis for new export industries. With which the country could earn its money in twenty-five years’ time and contribute to a more sustainable world as well. Our second request would relate to the position of our agriculture and horticulture in government policy. Those areas have had rather less attention in recent years. In the Netherlands however, agriculture and horticulture, together with the chemical industry, are more than half of the industrial sector, unique in the world. This is the combination that will be the backbone of future industry. We therefore propose to reform the Ministry of Economic Affairs into a Ministry of Agriculture and Industry. In order to set the priorities straight. And with these words I would like to present to you a copy of our book ‘Green Growth’. Text of the speech at the occasion of the presentation of our book Green Growth to the select committee for Economic Affairs of the Dutch parliament.